Northstar Lodge is a spacious, rustic, four bedroom, 3 full bath custom log home located in Clark, Colorado, 25 miles north of Steamboat Springs and wonderful downhill skiing. We are in North Routt County, right in the heart of the area's best snow-shoeing and cross country skiing, not to mention hiking, ice-fishing, fly-fishing and just relaxing. We are 30 miles south of the Wyoming border, and within 2 hours of some great day trips in the summer while the Wyoming roads are still open. Sometimes there are problems with notifications from VRBO. If you don't hear from me within a few hours of your inquiry, please email or text me directly, roselynnscott27@gmail.com or 817.807.6748. With magnificent views of the Zirkle Mountains, it is designed for comfort and relaxation for families and larger groups. Our region is host to numerous outdoor activities for your enjoyment, including fishing and other water activities, hiking and biking, horseback riding and pack trips, snow-shoeing, and downhill skiing. All year long you can enjoy the refreshingly clean and clear air and countless stars like you may never have seen before. Late at night you can see the Milky Way in the wonderful dark sky. Summer is graced with Colorado's glorious wildflowers, and autumn plays host to all those spectacular aspens. The snow and evergreens make for a postcard perfect Christmas and Holiday season. There is no bad season here. We have several good restaurants nearby if you don't feel like cooking or driving to Steamboat. Several of the local restaurants have live music on weekends. The Hahn's Peak Cafe and the Hahn's Peak Roadhouse have delicious food at reasonable prices...happy hours, too. To the south is the Glen Eden Tavern and the Clark Store, our 'everything store'...in addition to the usual convenience foodstuffs, they have a delicious deli and coffee shop, library, post office, liquor store, gift shop and wi-fi spot. There are also plenty of current magazines near the old wood burning stove...you can read while having a coffee and a snack.....watch for their home-made pies! In the summer, they have the ice-cream parlor on the outside deck....if you are early you can grab a Denver Post or the free local Steamboat Today newspaper. Our kitchen is ready for you to cook YOUR favorite dishes, and is well stocked with utensils and heavy duty stainless steel pots and pans, and more. We are constantly updating everything....we love this home and want you to, also. The deck and covered porch have plenty of chairs, a propane barbecue grill, and a couple of rustic tables for outdoor dining. All you need to bring is your food and drinks and your clothes and toiletries. The den can be closed off so that some guests can read or watch movies without disturbing others. In the summer, you can watch the 'hummingbird wars' on the front porch. We have numerous bird feeders and birdseed that attract other local birds. Our home library contains books about the history of our area, our wildflowers, birds, etc., in addition to plenty of other good reads. The back door leads to a perfect 2 mile hike...a loop that takes you to another view of the Zirkels, and also of Sand Mountain, Elk Mountain and more. In the aspens, you can frequently spot the gorgeous Colorado State flower, the blue and white columbine amid the tall ferns and evergreens. In the summer, we call Steamboat Lake our 'beach'...great place to take a picnic and go swimming. Hahn's Peak Lake and Pearl Lake are peaceful and beautiful, and with the right permit, you can go fishing, too. The Clark Store, Hahn's Peak Roadhouse and the Steamboat Lake Visitor's Center have the permit information and can sell you the permit needed. Hahn's Peak Village is just 4 miles north on Routt Co. 129. In addition to good food, you can check out some of the original turn of the last century miner's cabins, the one room school, the old jail and more. Steamboat Lake is right across the road. For the adventurous, you can hike to the top of Hahn's Peak, 10,839 feet. It takes about 2 hours to climb up and about an hour to come down. An old Ranger station is on top of the peak, and the views are incredible. Always check the weather before starting a climb, weather can change in an instant. It can snow or hail any day of the year....I've seen both on the Fourth of July more than once....be prepared! A sweater or jacket is always a good idea, even in the summer. is only open in non-snow season. The stars at night are so spectacular....if you haven't seen Colorado skies at night, you need to. In summer, you will see the Milky Way like never before, and if you are used to city skies, be prepared to be astounded by the beauty and clarity of our clear, dark and beautiful skies. If you need help with special events, such as planning a reunion or a wedding, we can help you with finding an appropriate location and the details such as caterers, etc. to make your event memorable and enjoyable. We hope you will consider our cabin YOUR cabin, and that you will return often. We built this home with the help of a local log-builder. As much as we love our home, we can't be there all the time. We also love sharing it with others and hearing about the good times that they have had there. Many of our regular renters call Northstar Lodge 'THEIR' mountain home....all of the pleasures with none of the maintenance. This house was built for us by a local log builder who has been our friend since the 1970's.We are 25 miles from Steamboat Springs and the drive through the horse farms and hay fields is truly beautiful. For years we came to Clark/Steamboat for vacations, winter and summer. We are totally in love with the area, year round, and decided to build a home here. Spectacular views from the porch, and if you hike up the hill behind the house, even more spectacular views of the Zirkel Mountains (a.k.a. the Continental Divide), Sand Mountain, Elk Mountain and more....the house is designed for comfort and relaxation. Our library has numerous books by local people, telling their stories of living here as settlers, back before log cabins were 'cool'. I am a cook, and made sure that all pots and pans and utensils were just like what I have at home. In the bedrooms, all linens are 100% cotton, feather duvets for every bed,...comfortable surroundings to spare. During the summer and early fall, our deck has numerous containers of flowers, gardens surrounding the home have gooseberries, red currants, herbs, rhubarb and beautiful perennial flowers that can take our cold winters. If you come during the Christmas season, we will provide a fresh-cut tree with lights and decorations for your enjoyment. We have many wedding guests in the summers, as our neck of the woods is popular for destination weddings at the Glen Eden, Midnight Ranch and more nearby gorgeous spots. Each season here is special, and really, like the locals say, there is no bad weather here, only improper clothing....so be sure to pack accordingly. From the front porch you can see the Zirkle Mountains in the Continental Divide and Hahn's Peak to the north. Afternoon sunsets usually have alpenglow...and the stars at night are incredible. Central heat keeps things toasty in the winter. Five ceiling fans help circulate air year-round. Front loading washer/dryer in the laundry/mud room….. with laundry soap and dryer sheets provided. The living room , dining room and kitchen are in one large area with picture windows and glass sliding doors to the deck for viewing the Zirkle Mountains (Continental Divide), and more. A French-door refrigerator with an icemaker; plenty of room. A Vintage Tappan gas stove and oven makes cooking and baking a pleasure. Easy to follow instructions are prominently displayed. Gotta have coffee sitting on the deck in the morning... a coffee bean grinder is in the cabinet, too.. An electric kettle provides boiling water for tea and other beverages. The spice rack is loaded with a variety of seasonings. There is service for 12+ and it is all heavy duty; ceramic dishes, water and wine glasses and stainless flatware, no flimsy utensils here. There is a radio/cd player and a cord to plug in your mp3 player or phone. We have an assortment of cd's, or bring your own. Bring your own discs or rent them in town or at the Clark Store. We have a dvd player in a vintage TV cabinet in the den. There are many books, some donated by renters. There is a section of local writers that focus on the history of the area. Many cookbooks, and local hiking skiing and motorized trail info, too. There are several board games and jigsaw puzzles in the house; none of them need to be plugged in. No "lawn", we prefer the natural landscape, but there are gardens with perennial flowers and herbs, and a wonderful rhubarb garden for baking delicious pies in season. There is a 40' deck, complete with tables and chairs for outside dining, and a 50' covered porch. Great for watching the hummingbirds, mountains and double-rainbows. Full length covered porch and side deck with spectacular view of the Continental Divide, 'Cook Anything' fully furnished kitchen, Hiking out the back door, Many local activities but lots of folks just want to relax in this comfortable, inviting home.. At night, the stars are spectacular. For Christmas rentals, we can provide a fresh-cut tree with ornaments if you desire. Many families consider this 'THEIR' mountain home and have come here annually for up to 16 years. For Christmas rentals, we will include a fresh cut tree with bubble lights, ready for you to add the provided decorations. Our group consisted of 3 adult couples and 4 children. We loved the great kitchen and dining table and many areas for relaxing. We did lots of cooking, took walks up the road and sat on the deck enjoying the great views and all the birds. We also went to Steamboat Lake to swim and fish. Everyone enjoyed a trip to Steamboat for the day for activities and shopping. The cabin is filled with antiques and collections of the most interesting historical objects and art. Hard to describe but very interesting and part of a wonderful atmosphere. The bedrooms and bathrooms were great. Lots of helpful notes around the cabin. The owner was extremely helpful and quick to respond to any questions we had. I would highly recommend this property if you are looking for a quiet and relatively secluded place that is well cared for. It was truly a Colorado mountain experience. I'm so glad you had a wonderful time... You made me hungry for some rhubarb crisp! If I did that every single day I'd be healthy as can be! Please do come back... It's really pretty up here any time of year! My family and another family came to Clark for a spring break vacation from Florida. Between both families, there were 7 kids (ages 6 to 16) and 4 adults. We learned of this location from VRBO and I have to say we got more than we ever dreamed of. We arrived on March 9 and the community looked like a winter post card scene. The cabin was in a beautiful setting on the hill. It had all the luxuries of home at a great location. The online photos cannot come close to the beauty of this cabin or the setting. The owner was very accommodating for our families and helpful in the weeks leading up to our trip. She even called the day we arrived to make sure everything was ok. While there, the kids left their marks in the fresh snow, we snowmobiled at Hahn's Peak Roadhouse, went skiing, went to the Hot Springs in Steamboat Springs, and even worshipped at Steamboat Christian Center. We were sad to leave but after this experience, I'm sure we will be back. I'm sure the kids had a ball.... Sounds like you did everything you had planned to... I bet the kids haven't stopped talking about it.... Hope to see y'all in the near future. Cabin in the clark co.
We had a great time at the cabin and the scenery was great, this was one of the most relaxing vacations I have had in a long time, and we hope we can come again. We had a great stay there in Clark. Rose's cabin had all the amenities plus some. We had planned for 6 or 7 people to stay there, but in the end it was just 3 of us. The travel time to Wyo where we had our licenses was ok but we did not expect the snow on opening morning. By Tuesday we had 2 to 3 feet in the areas in Wyo where we wanted to hunt and we had to change our plan. We did see a lot of game in both CO and Wyo during the week. I don't know if Rose regularly rents to hunters or not, but if she does a great additional would be a pole out back, 8 to 10 feet high with an arm at the top to support say 250 pounds. Non hunters would never know what it was for, but any hunter would immediately recognized it as a place to hang a game animal for cooling or skinning. It would be a plus for hunters. I'm glad you had a good time in spite of the snow... It varies from year to year so nobody can really predict... I've seen it snow on the 4th of July more than once. We would love to have you back anytime... Thank you for choosing our home and thank you for this review. Our stay was more than wonderful. This was our 1st Family Mountain Get-Away in Steamboat Springs and every one of our 14 Family Members loved it. The pictures online do not do it justice. Its super cozy and quaint. The decor takes you back in time and totally adds to the experience. The cabin has EVERYTHING you might need. Just bring your food and clothing. Rose, the owner, is great to work with and is super nice. You cannot beat the location! We were 3 min from entrance to Pearl Lake and 5 Minutes to Steamboat Lake. We hiked the Routt National Forest, Fished Steamboat and Pearl Lakes (Caught 7 Fish! ), we went Target Shooting and just hung-out in the cabin. Some family members did not want to leave the coziness of the cabin! The Deck/Porch has some of the best views by far. Our family really enjoyed our stay to say the least. We plan to be back next year! So comfortable, best kitchen! Like they said, bring your clothes and food.....love this cabin! And the 6' claw foot tub! 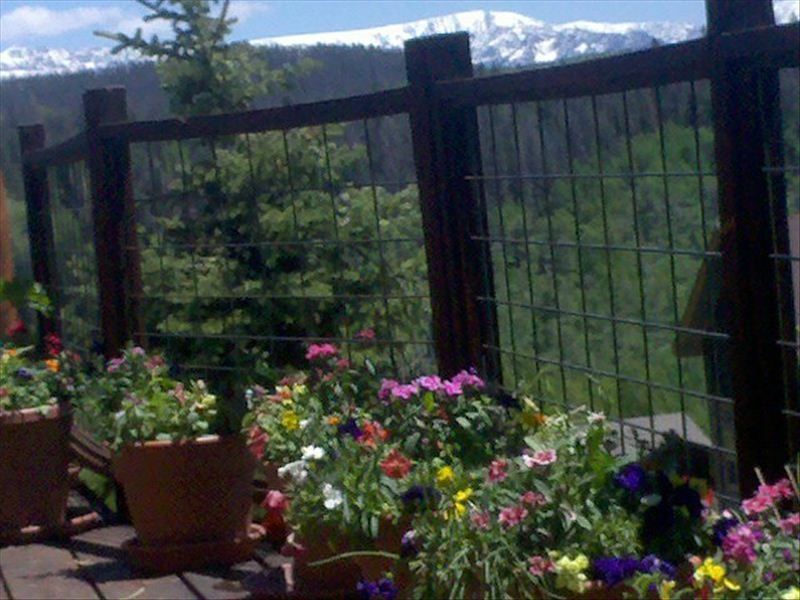 In and around Steamboat Springs are two wonderful hot springs; open year round for relaxation in a beautiful natural setting. Strawberry Park Hot Springs is gorgeous, on top of a mountain, great in the winter. They only accept cash, call first for admission $ and times. In town is the Steamboat Springs Recreation center with hot springs, a water slide, swimming pools and a fitness center. In summer, the Alpine slide, the Howler (on Howelson Hill) is a favorite with kids of all ages. Year- round, you can take a ride to the top of the ski mountain on the gondola. There are snowmobile rentals nearby our home, with or without guides. If you are bringing your own snowmobiles, they will need to be trailered in and out. There is no snowmobiling around the cabin. Several horseback riding facilities are near our home and downtown, also Rafting/tubing down the Yampa River in the summer is a blast! Hiking everywhere, no shortage of fun activities year-round. And then, there is plain old relaxing and 'watching the mountains grow'. Come see! For "short notice" booking if the house is available, please contact us and we may be able to "make a deal" on rates.Cancellation Policy: If you cancel in writing (to us, not VRBO) three months before arrival, we will refund your money. For cancellations less than three months before arrival, we will refund your money if we are able to re-book your dates; we will refund you the amount we receive.